Tonight's aromatic and hearty soup is the perfect meal for a raw, wintry evening. Rich with root vegetables and lamb broth, I started it last night and refrigerated it overnight so I could easily skim excess fat off the top before adding the vegetables. And, like many soups, this one is delicious hot from the pot, but even better the next day after all the flavors have had a chance to meld. A simple, honest soup, infused with cumin, coriander and just the right amount of heat from red pepper flakes, this meal is sure to warm your belly and your soul. 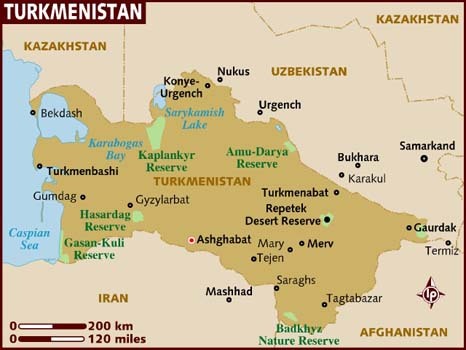 One of six independent Turkic states in Central Asia, Turkmenistan was a constituent of of the Soviet Republic until 1991 when it declared it's independence. This beautiful, rugged country is bordered by Afghanistan, Iran, Uzbekistan, Kazakhstan and the Caspian Sea. A country many may not have heard of, Turkmenistan is the world's 4th largest producer of natural gas reserves, although much of this valuable resource is covered by black desert sand. The country is also one of the world's largest producers of cotton, and is known for producing beautifully embroidered silk fabrics. The county's long and interesting history includes conquests by the Achaean Empire of Ancient Persia and Alexander the Great, as well as the establishment of the Silk Road trading between Asia and the Mediterranean. In the 7th century, the Arabs conquered the region and introduced Islam and by the 12th century, Genghis Khan took control of the eastern portion of the Caspian Sea. Up until the 19th century, the Turkmen people lived under the rule and strife of various empires and labored under inter-tribal wars. By 1894, Russia gained control of the country and incorporated it into its empire. But with the collapse of the Soviet Union, the country eventually declared independence. To this day however, the country maintains severe restrictions on foreign travel for citizens and struggles with discrimination against ethnic minorities. Cuisine in Turkmenistan has many similarities to Central Asian cooking as well as nomadic traditions, but differs in it's frequent use of fish, owing to it's proximity to the Caspian Sea. Overall, food is quite simple, using a variety of vegetables, radishes, tomatoes, onions, red and black pepper, mint, parsley, safron and garlic. Lamb, or mutton is the most common source of protein. Pilav, a lamb, carrot, rice and onion dish is among the most common. And, Shurpa (tonight's dish) is a regularly enjoyed soup made of lamb broth, potatoes (or root vegetables) and tomatoes. Bread is also a staple food, and cooked in clay ovens in nearly every home. Fruits and vegetables are grown in great variety, with melons being one of the sweetest, best crops the country offers. In a large Dutch oven, brown the meat in the hot oil over high heat for about 5 minutes, stirring occasionally. Stir in the onions and cook 5 or so more minutes, until the onions are softened and have taken on color. Spoon off all the fat that you can, pour in the stock, and bring to a boil. Reduce the heat, cover, and simmer for about 1½ hours. Refrigerate the soup, preferably overnight, so you can easily remove the fat. About an hour before serving, start chopping the vegetables. Bring the skimmed soup to a boil over medium heat, then add the turnip, zucchini, carrots, peppers, tomatoes, cumin, hot pepper flakes, coriander, and chickpeas. Cook, covered, for 30 minutes. Salt to taste, then stir in the vinegar. Cover and let stand for 15 minutes. Ladle into bowls and garnish with lots of finely minced cilantro. your pictures are so beautiful!!!!! I really wish that I could get my husband to eat lamb because that looks delicious! Haven't tried a lamb soup yet, despite having lived in Aus for so long! Thank you, Zonia! You made my day!! Best Regards to you from the frozen land of the Northeast USA. YW - That sounds amazing! I LOVE goat and coconut combined. Are you sure you're not West Indian? ?